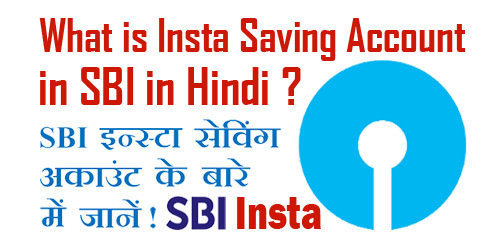 pixel What is SBI Insta Saving Account (yono) in SBI Bank in Hindi - Full Information in Hindi ! What is SBI Insta Saving Account (yono) in SBI Bank in Hindi - Full Information in Hindi ! What is SBI Insta Saving Account in SBI Bank in Hindi ? तो चलिए दोस्तों अब आपका ज़्यादा समय बर्बाद ना करते हुए हम आपको SBI Insta Saving Account के बारे में जानकारी देना शुरू करते हैं | लेकिन उससे पहले दोस्तों यदि आप चाहें तो हमारी इस वाली पोस्ट को भी पढ़ सकते हैं - What is ASAP Saving Account in AXIS Bank in Hindi ? Aggregate Balance Up To Rs. 1,00,000. Annual Transaction Up To Rs. 2,00,000. No Minimum Balance Charges Till 31st Mar 2019. Maximum Balance in Account Can Be Rs 1,00,000. 1.) The Applicant Should Be More Than 18 Years of Age. 2.) Applicant Should Have Valid Aadhaar & PAN Number. 3.) The Mobile Number Should Be Linked With Aadhaar. 4.) It is Not Available For Existing Customers Of SBI Bank. 5.) Applicant Should Be a Indian Resident With Indian Address Proof. Nomination is Mandatory in The Account. It Will Be a Singly Operated Account Only. The Balance in Account Cannot Be Above Rs 1 Lac. No Minimum Balance Charges Till 31st March 2019. No Branch Transactions Are Allowed in This Account. A Personalized Rupay Debit Card is issued in This Account. Branch Selected By You Will Be Home Branch For The Account. This Account is Only For Resident Indians, Above 18 Years of Age. The Account Will Be Closed If KYC is Not Completed After 1 Year. The Total Credit Summations Permissible is Rs 2 Lac in The Year in The Account. Aadhaar Card Having Mobile Number & PAN Card is Mandatory For Opening This Account. You Can Upgrade This Account To Digital Savings Account or Regular Savings Account Within 1 Year. The Account is Opened On OTP Based e-KYC of Aadhaar; And Requires Full KYC To Be Done By Visiting a Branch of Bank. This Account is Valid For 1 Year Period; Within Which You Would Need To Complete KYC By Visiting a Branch of Bank. उम्मीद करते हैं दोस्तों कि आपको पता चल गया होगा - What is SBI Insta Saving Account in SBI Bank in Hindi. 1.) How To Open New ASAP Account in Axis Bank Online Using Mobile in Hindi ? 2.) How To Register & Activate SBI YONO Mobile App Through SBI Net Banking ? 3.) How To Request For New ATM Card in SBI Through SBI YONO App in Hindi ? 4.) अगर अपने एसबीआई खाते में नहीं मेंटेन कर पा रहे हैं मिनिमम बैलेंस, तो अपनाएँ यह तरीका ! 5.) How To Transfer/ Send Money From BHIM UPI App To Any Bank Account in Hindi ?